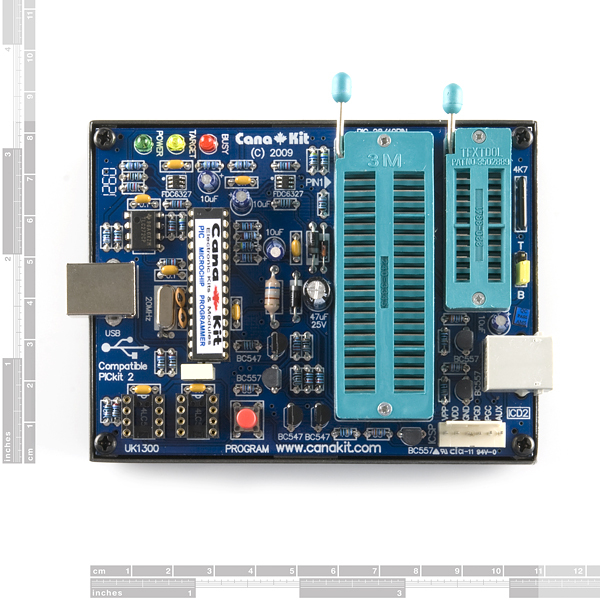 This PIC programmer, from Cana Kit, is a professional USB PIC Programmer offering ZIF (Zero Insertion Force) sockets, an ICSP header, and an ICD2 port for easy PIC programming. The programmer is 100% compatible with MPLAB (PICkit 2 interface), and therefore can program practically any PIC microcontroller including the PIC16F84A, PIC16F628, PIC18F458 and PIC16F877. Does anyone know if this works with Windows 10? MPLAB X? I use one on Windows 7 but people claim it doesn't work on Windows 10. Before I get one does anyone have any recent experience with one? The Cana Kits programmer is the best programmer I have owned. 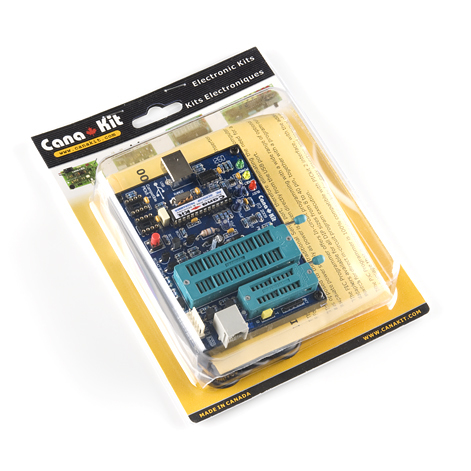 The Cana Kit programmer is a true USB programmer not a serial/parallel device converted to work with USB. The programmer is made with a protective sturdy metallic bottom base for a finished product. The other programmers have no bottom base. The Software is Cana KITs MPLAB/Microchip and works great and is easy to install and use. is it OK with win 7 ? Anyone know if this would be compatible with PICBASIC? Or whether there is a BASIC compiler that it would be compatible with? I am using this programmer with PICBasicPro. Works like a champ, very fast. It uses pikit2v2.exe to write the hex to the PIC. To use the 'Compile and Program' button in PBP, setup a custom programmer pointed to pikit2v2.exe to launch the app from the microCode studio. Very easy and a faster burn than some I've used which are probably using built in serial to USB convertors. A note of caution when using this programmer to program devices in-circuit... VDD (5V) is only generated during actual programming. Otherwise voltage on the VDD header pin is close to ground. 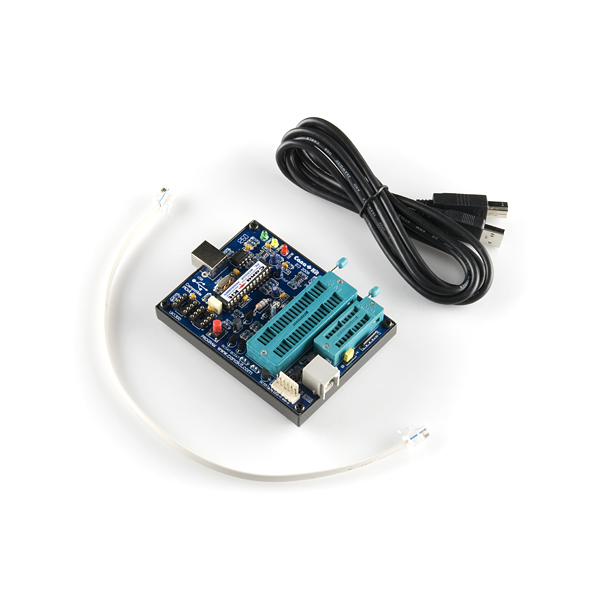 If you try to connect this programmer to a live board it will essentially short the board's 5V to ground, which, depending on the design, can lead to problems. Microchip's PICKit2 programmer doesn't have this issue and, in my experience, can program boards that are powered on. can this be used to program pic 16F84 in mplab ? i found out that PicKit2 is NOT supported for pic16F84 , but in the description above they say it can be used with 16F84 pic. can it still be used to program pic 16F84 ? i have alot of this pic and i want to make use of them. 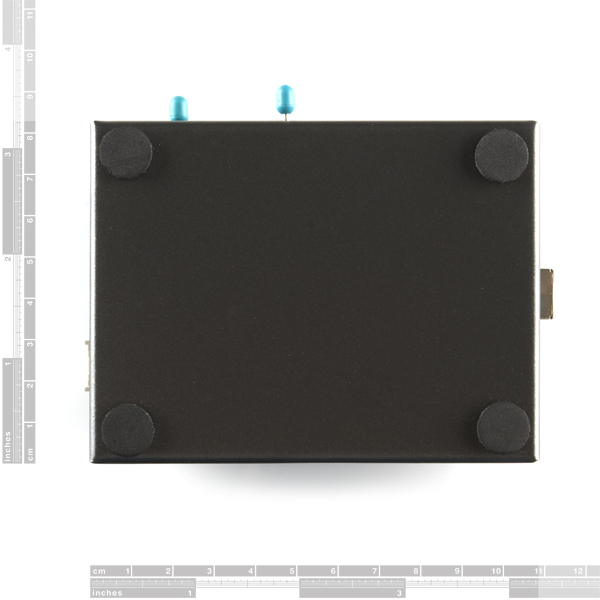 The 16F84 was replaced by the 16F84A, but they're pin-compatible, so any programmer that handles the "A" version will still work with the older non-A version. This includes the PICKit 2. Hey, does anyone know if this plays well with Mac OS X?? Thanks. Does this allow debugging the baseline devices with just the pickit 2 (no ICD headers, etc)? How would I use this programmer to program my PIC 18f8722 in circuit with a 2 x 5 header? Is there a cable for that? Thanks, Danny. Can this two program the same list of chips "MPLAB Compatible Mini USB PIC Programmer" & "MPLAB Compatible USB PIC Programmer"? "The programmer is 100% compatible with MATLAB (PICkit 2 interface)"? Almost jumped thinking Matlab does PIC now. It's ok SparkFun, we still <3 you. Is this compatible with the PicKit 3 as well? SF doesn't seem to carry the PicKit 2. The good: High quality, well made, plenty of connection options. Works well. Not so good: The supplied software is very old. Will not install on Windows 8. Installs okay on Windows XP. The hardware will not work with MPLAB on a Mac but this is probably more a Microchip issue than a Cana issue. Overall, I am happy with it and using it from Linux (Ubuntu) and under Windows XP in VirtualBox on both Mac and Linux. I rate it as one of the best for versatility and quality. I needed to program several old PIC 16C73 parts to repair a device I built 20 years ago. The old programmer didn't work because it had a serial port interface and would not work with a USB to serial converter. So I bought this thing. Sadly it doesn't support EPROM PICs.